We invite you to join businesses around Houston and across the world in celebration of Earth Hour, by turning off the lights on March 25th from 8:30 PM – 9:30 PM. 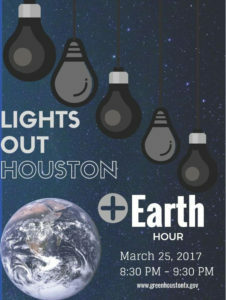 This year, Lights Out Houston, a voluntary, Houston-wide commitment to energy efficiency, is joining with Earth Hour, a world-wide movement that started as a lights-off event in 2007. Help Houston flip the switch toward energy efficiency and a sustainable future.For almost a decade, the City of Houston and top commercial property owners and managers in the Greater Houston region have participated in this conservation effort, reinforcing a community-wide commitment to energy conservation. Join millions of people, spanning 178 countries worldwide, by turning off your lights for one hour to show your solidarity with the planet and the fight against climate change. Building owners, managers, operators, tenants and home owners can also pledge to implement energy efficiency measures and operating procedures. Here are a few helpful tips for preparing for the Lights Out + Earth Hour weekend. These are only suggestions and each facility needs to take into consideration individual security concerns. Security is paramount to turning off unnecessary lights. Start preparing today. It will take time to coordinate getting all of the lights turned off and communicating with your tenants, security, housekeeping and engineering. Facility management, engineering, security and housekeeping should start providing you reports on a nightly basis on the percentage of lights left on and which floors. Train your security, housekeeping and engineering teams to help you turn off lights in occupied offices. Send a note to your tenants about Lights Out Houston+Earth Hour and ask for their assistance in turning off lights when they leave at night. Send a note to your tenants that your team will be turning off lights in unoccupied offices after hours. Offices that are still occupied are not being asked to turn off their lights. Those tenants should consider how many lights are on while they work. Historical, landscape and decorative lighting should be turned off for the event (unless part of security lighting). Check lighting control system settings. Security lighting should remain on. Tell your friends and family to turn off unnecessary lights at work and at home.